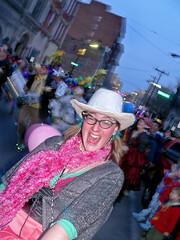 Mardi Gras Lexington 2006 Pix are up! If you weren't there, check out some pix from the 3rd Annual Lexington Mardi Gras Parade, brought to you by a lot of cool people and one super cool dance studio and a rare-form collective. Click on the Mardi Gras Cowgirl to see the entire set on Flickr. Things ain't looking so good from my morning trip to the 'Burbs. But there's this new thing that I had to try: Bought some blank DVD's at BestBuy.com and specified in-store pickup. 'Cause, y'know, I've got 30-plus blank DVD's but I need 50 more, right now… especially since P2P may get sued out of existence soon. I've got to get the entire Planet of The Apes oeuvre downloaded, right? By the way, late morning is definitely the best time to cruise into suburban hell, I confirmed. Lots of people are either safely tucked away in their workplaces, or maybe they're at home planning the big afternoon foray to the mall. So there's this quickie mart out there, and there's a sign out front that says "Red Bull in stock, or yours is free!" Excuse me? What a fabulous tribute to the brain-rotting effects of too many Raging Bulls, eh? Just tell me where to go to get my free Red Bull that you don't have in stock! Next up, could it be a new Walgreens? Sure, pard'ner! 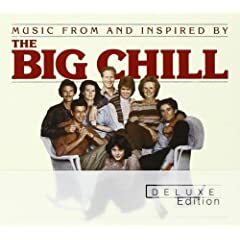 One of the great surreal late-night spots (just visit any Walgreens at 3:30am and not see some kind of weirdness, while toe-tapping to the most neutralizing muzak mixture ever to dribble into your ears). The thing is, this sign: "Coming Soon! Walgreens!" is about a hundred yards down from—wait for it—a Walgreens. I guess this ones going to be even super-er than its predecessor. I have to take my fair share of the blame for this bloat. Fleeing back downtown, I privately lamented the lack of a mega-grocery on the right-hand side of the road; Because I coudn't be bothered to —you know—turn left to go to the mega-Krogers and just rolled on by. Am I Working in a Department Store? Sometimes I feel like I'm working in a department store. It's all this damned techno that I listen to. Actually, I'm typically at home working in my pajamas; But by the sound of it, you'd think I was working in some windowless cubicle at Barney's or something. I can't figure it out—You know the old saw: "Television will rot your brain;" Personally, I'm more concerned about Hotel Costes, Cafe Del Mar, and a jillion other fluff electronica series that I —for some reason—continue to put on as my work soundtrack. The other day, I was on the verge of apologizing to Lucy. If you're married and/or work at home, you could find yourself in the same boat: "Honey, I'm sorry about all the electronica…"
Truth be told, there is a reason, or at least, an excuse: I'm gradually aspiring to be a snobby art gallery DJ. With some success, too. So I act like I have to listen to this stuff, y'know, to keep up. I'm still embarrassed sometimes. One of the finest (non-electronic) tracks last year was The New Pornographers' "Sing Me Spanish Techno." Now, nobody knows what Carl Newman is talking about at any given moment; even he claims the lyrics are frequently non-narrative. But I like to think that song refers to a couple of friends: One hates techno, the other loves techno. His favorite (of late—because it's always 'of late') is Spanish techno, in particular. His techno-hating friend is put out over the fact that all techno sounds roughly the same and —it's not even music, right?— issues the challenge: "Okay. Sing me 'Spanish techno.'" Exactly. Somebody get me an electric guitar, quick.